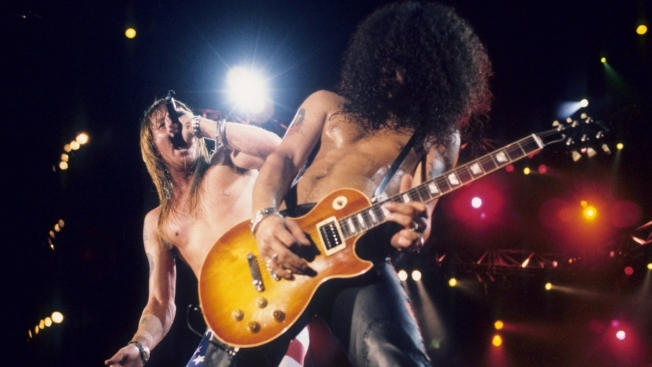 Axl Rose and Slash of Guns N Roses perform live at Rock In Rio II on January 15, 1991 in Rio De Janeiro, Brazil. Guns N’ Roses announced the band's new summer tour dates Friday and they include a stop in Chicago. The renowned rock band’s ‘Not in This Lifetime Tour’ will come to Soldier Field July 1. Ticket sales begin April 8 for the general public through Live Nation. The band’s fan club Nightrain presale and VIP packages will be available for purchase on Saturday at 10 a.m. Live Nation will also hold a Citi card member pre-sale from 10 a.m. Monday through 10 p.m. Thursday. Guns N’ Roses will kick off the summer stadium tour June 23 at Ford Field in Detroit and will conclude Aug. 22 at Qualcomm Stadium in San Diego. In honor of the band’s reunion, Guns N’ Roses are holding their first comeback show Friday featuring Axl Rose, Slash and Duff McKagan at Troubadour in Los Angeles.